"Guru Cemerlang, Negara Terbilang" is the theme of Teacher's Day and Appreciation Day in 2008 at SM.Advent Goshen that time. The students will be prepared in literature show, choir and art to express their respect to their teacher. It has been privilege for me to have you in this school. Life to me has been meaningful with the opportunities to serve you. I hope that the growing process in your life and study in this school has been harmonious. The school was started about 50 years ago. It was started with much hardships. But with the courage and determination of our pioneers and the help of God, we now have a strong school in the very heart of this community to serve them and their generations. I am very proud to say that many of the former students play and determination of the pioneers will serve as constant reminder and motivation to you. School life is full of challenges, fun and serous thinking. I trust that you have discovered for yourself what it means to have an abundant life; and that you have laid and erected it on our only sure Foundation and the Rock of our Salvation - Jesus Christ. As some of you leave GASS at the close of this year, you may forget us and GASS as something of the past. One of the best ways for studnets to acquire a sense of belonging to their school is to participate in extra-curricular activities and other group activities such as producing a school magazine. Therefore, I would like to congratulate all of the editorial staff for making the production of the first issue of this magazine a success. 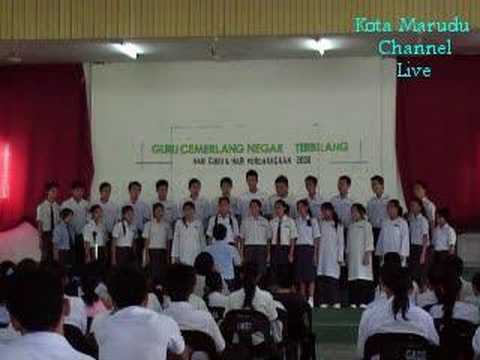 In this video is a voice and choir performances from students Form 5 and i was the videoman. Songs they perform are called Bengawan Solo and Dirgahayu Tanah Airku.